﻿ River Kwai Village Hotel, Kanchanaburi | FROM $60 - SAVE ON AGODA! 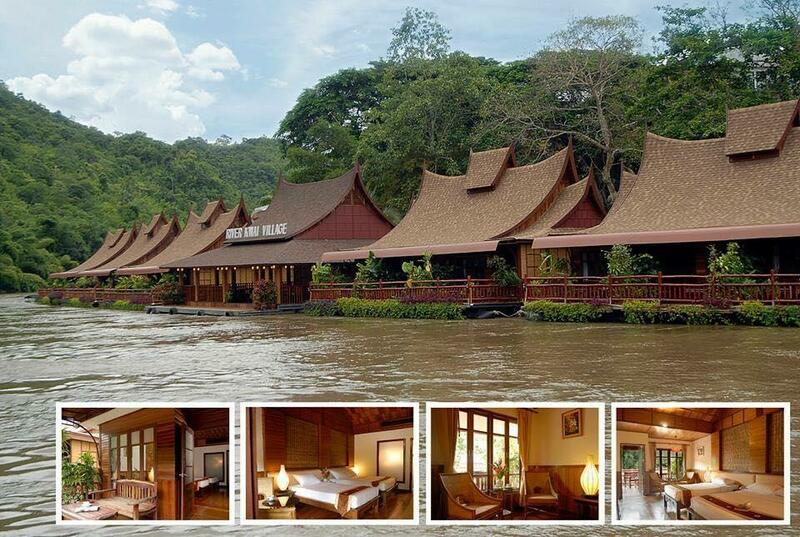 "Good for a group type like seminar/team building with outdoo..."
Have a question for River Kwai Village Hotel? "Good experience for hot spring." "It is quite and nice atmosphere." "Nice to stay with close to riverside." Kanchanaburi’s premier jungle resort, the River Kwai Village Hotel, is a perfect blend of luxury and unspoilt natural surroundings. The resort offers different types of accommodations to suit every need. 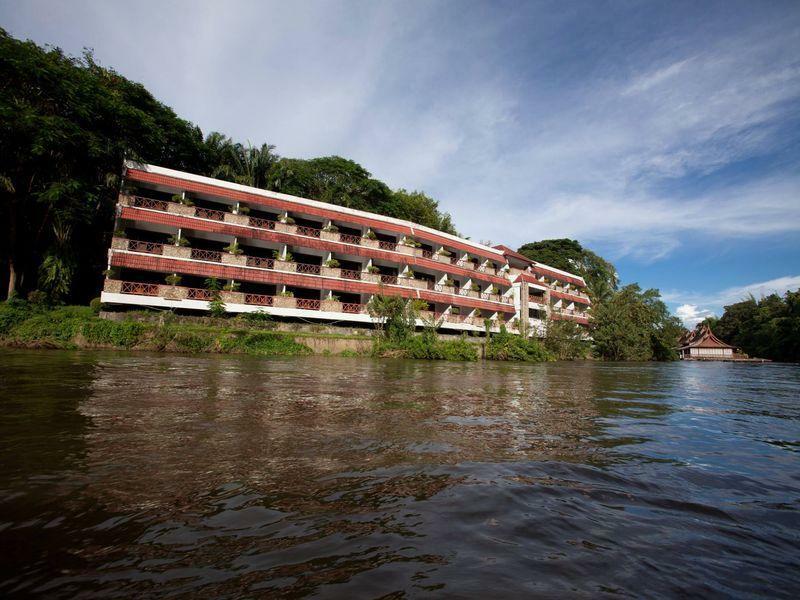 For a truly unique and memorable experience, stay on one of the luxurious air conditioned rafts on the Kwai Noi River and enjoy a spectacular view of the river and mountains beyond on your own private balcony. 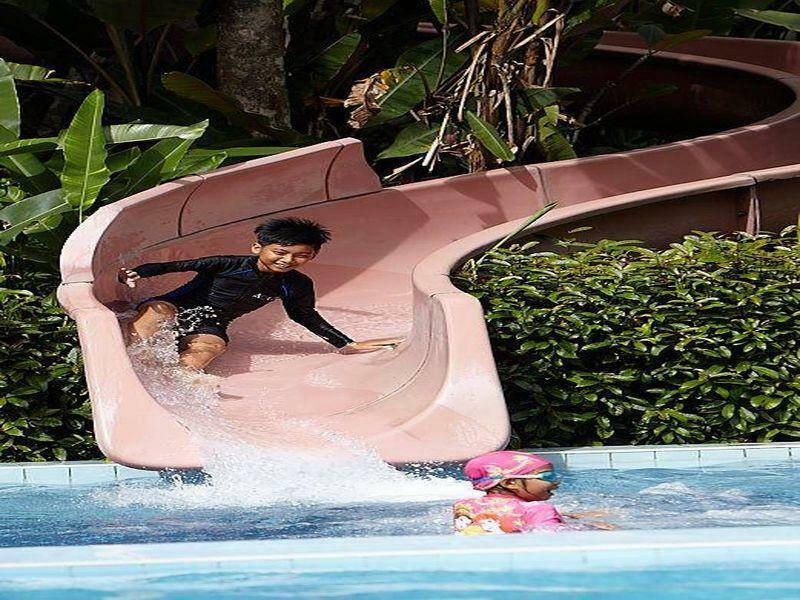 The resort grounds comprise stunning landscaped gardens, waterfalls, and two swimming pools with a water slide. 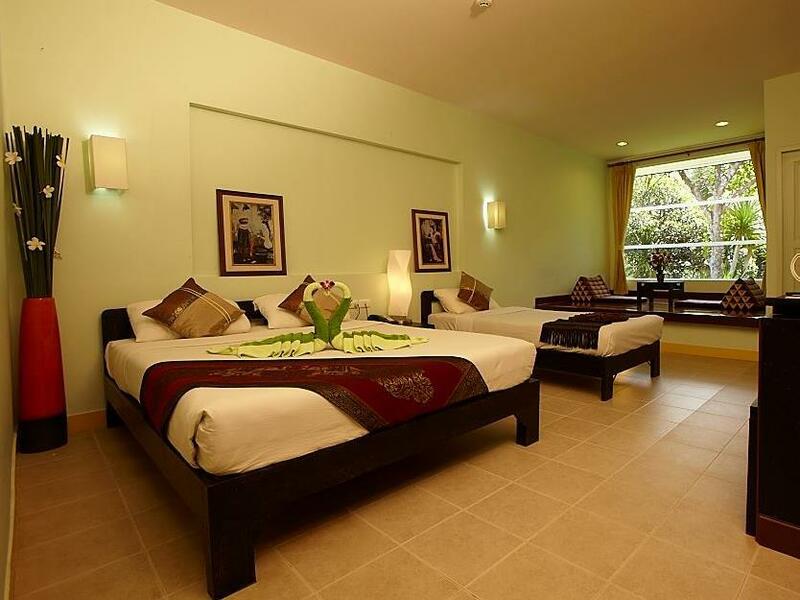 The resort also arranges trips to the town’s main attractions and elephant treks. Our secure online booking form makes reserving your room at River Kwai Village Hotel simple - just fill in your desired dates and click. "It was amazing to see a sun rise, above the green forest wit..."
Minimum age of guests is: 2 year(s). All I can say is that the room is very old, like you travel back in time for 10+ years. To charge your mobile device, you have to unplug a head lamp in order to find one to for your adapter. TV is a CRT screen, old refrigerator, etc. One good thing is location of the room on the river bank is good. Nice to stay with close to riverside. It is quite and nice atmosphere. there are many activities you can choose when you stay here. Especially, I recommend to use the hot spring spa. It is 2 min away by boat. appx. 3 hours spending there. We visited off season so were pretty much the only people there in this huge resort on the river. The old part of the hotel is a bit like a horror movie set but the new wing is great. There are some good faciities the slide in the pool is awsome. The minor bird gallery and their vocabulary is unusual We loved it for one night. I think its mainly a group conference place. I was there to enjoy the short holiday and the hotel served us best on both value for money and the location. We wanted to stay somewhere in rural area since we would like to escape the crowded space. The hotel has enough facilities for you to enjoy the stay. There are so many activities you can do within the hotel space. The staff are not bad but not what I would say good as well. Some are helpful but some are not. All in all, the hotel is a good pick for your holiday in Karnjanaburi. If you would like to find the hotel which comfortable and nice location in river and mountain, very nice spa (onsen Thailand), and many activities with adventure for your vacation. I strongly recommend this hotel. 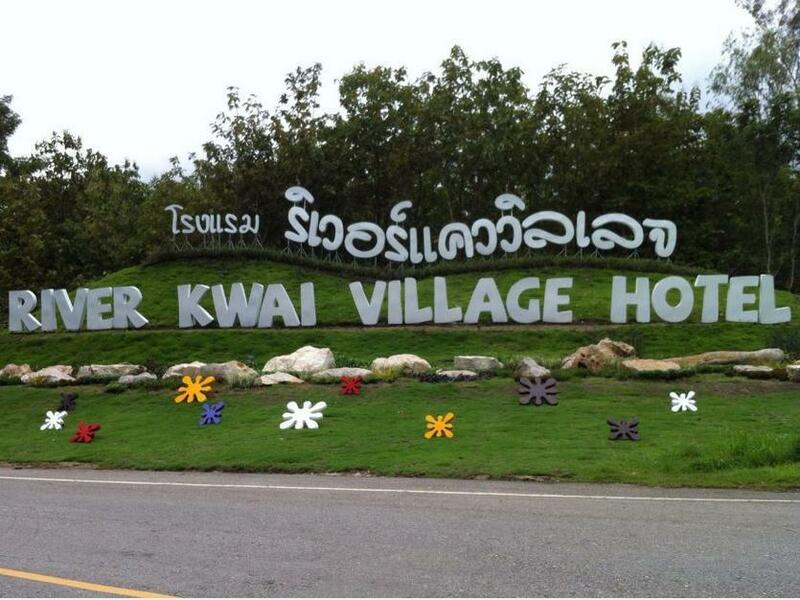 Approximately 1 hour drive from Kanchanaburi city in mountainous and bamboo jungle area, on the Khwae River. An extensive range of room options - the room I stayed was very comfortable. 3 pools. A range of outdoor activities, didn't ask about cost. Short drive to small village with restaurants and attractions, plus waterfalls and other cultural attractions in the area. The resort is worn down, room was moist, old TV and only 5 channels, all Thai and with snow on the picture. Hot water doesn't get to much over lukewarm, toilet flush handle was broken almost all the way off. Staff at check in was rather rude and upset that she could not get a Thai ID, although I showed her my Thai driving license, also wanted one from nanny who was not staying there. Room service overpriced and not very good but deliver fast and open long. Info folder outdated, for instance phone numbers are not correct. Pool was nice, but old and not at all kid friendly. We had both a frog and a scorpion in the room during a 2 night stay & for unknown reasons the room phone was called at 5 and 6 am. Hard bed & pillow. A car is mandatory to stay here. I stayed in a raft room on the river, and it was a good experience, but that’s all. The rooms are old and in need of major repairs, no hot water for the shower for 2 days, even after asking reception for someone to repair it. My shower didn’t drain properly, so it just filled with water. Forget dining in the restaurant, take the 10 kilometre trip into the nearest town to dine at another restaurant. The hotel restaurant was appalling, the food inedible, one mouthful of the dishes was all that could be managed, the staff where not interested in serving you, they where too busy watching the television, or asleep. The breakfast is worse, half cooked eggs with cold bacon and stale fruit, served by totally uninterested staff. The hotel itself is old and run down, beautiful location and gardens, but that’s the only good thing about this hotel. I could never recommend it. I reserved the old building that can't see the river and room is very old anyway it's cleans. Swimming pool is poor, need to renovated. BF is not satisfy. Recommended to go out for lunch or dinner at the waterfall area. Good experience for hot spring. Next time will reserve for new building next to the river. This hotel is located in the woods next to the river. Its very quiet and peaceful. However, on the night we stayed there was a party with load music. Luckily we booked a Raft room, so could not hear much noise. The room is big with all necessary amenities and very spectacular view! It was amazing to see a sun rise, above the green forest with fog. The hotel has 2 pools, second one is on the other side with a small slider. Even through the pool was not so clean by kid had a fun time there. Breakfast was fine, not bad, but not so great as well. However, they have various of activities which are very closed to the resort. You should try ATV! Was inistally attracted by the hot spa, however no where on the site does it say you need to pay for it. 550baht per person is not cheap but we did it and enjoyed it. Just a shame they do not mention it as an extra to be paid for - I expected it to be included. Food at breakfast was average at best and definitely aimed at the Eastern European tour groups. Of which this hotel gets plenty. Food for room service was very poor according to my Thai wife and the food we had in the restaurant on our first night was also average at best. The room which I booked was around 3,300 THB. Although, the room is recommended for 2 persons but beds are wide enough for 3 persons to sleep together because there are 2 adjacent queen beds. The size of the room is big too, you have enough area to walk around the room without feeling too cramped. However, the price of adventure activities are too expensive. You need more than 500 THB for riding ATV in the specific area. Hotel for groups. Seems like some parts have never been renovated in 30 years. Not recommended for relaxing. Cliff wing room was new with nice river and mountain view. Big swimming pool. Good A-la-carte dinner but horrible breakfast. Great room size. Great pool. Very helpful and friendly staff. Our stay was absolutely amazing. We got the Royal Wing rooms and they were gorgeous. The staff was so friendly and helpful and went above and beyond. The hotel was perfect.We intend to go to this hotel because of new very good spa, Rock Valley Hot Spring Fish Spa. I would recommend this place to anyone. Stayed here for 2 nights and the room was beautiful, the views are breathtaking and surrounding hotel very nice. There was a little bar which was fun with the locals singing and chatting. Would stay here for views alone. Food good too but breakfast mainly Thai. I could not fault it. We were actually 2 half families but the room accommodated us all amazingly. Pool is great. The hotel hosted a big international running race, so was particularly busy but the staff were still attentive, helpful and kind. Great hotel. Our stay was absolutely amazing. We got the river raft rooms and they were gorgeous. The staff was so friendly and helpful and went above and beyond. The hotel was perfect. I would recommend this place to anyone.